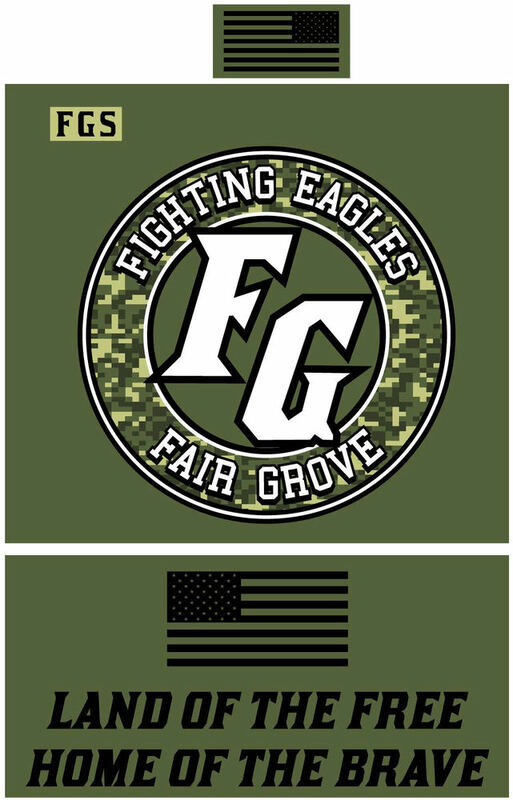 Fair Grove Schools is proud salute those who gave of themselves to serve our great country, with “Military Appreciation Night.” We have created a shirt to honor those who have given their all to protect our freedoms that we enjoy. Help us in honoring all of our military men and women by purchasing a Military Appreciation shirt for just $10, and show those who have sacrificed how much we appreciate their service. Our brave men and women will be honored at the following Fair Grove / Strafford HS basketball games: The girl's basketball game will be @ Strafford HS on Thursday, February 15th 6pm. The boy's basketball game will be @ Fair Grove HS on Friday, February 16th 5pm. Proceeds from the t-shirt sales will go to benefit a local military organization and/or family. T-shirts are $10/piece. Sizes 2XL and above have a $2 upcharge. You will pay for your shirt(s) whenever you come to the HS office to pick them up. Please make checks out to FAIR GROVE SCHOOLS. ORDERS WILL ONLY BE TAKEN UNTIL 3:00 PM ON THURSDAY, FEBRUARY 7TH.